As our 11 universal year comes to a close, I thought I would share some final thoughts on what this intense and liberating energy taught us. Part 1 of my 11 universal year analysis can be found here. The 11 in numerology represents enlightenment, illumination, awakening, and authenticity. It is a master number because these are some of the hardest things to achieve. This year saw us having to confront our authenticity. We were tested with lessons and hardships in order to get to the root/core of who we are. Those who were born with an 11 lifepath, are the “late bloomers” of the world as they struggle with embracing their true selves. I’m an 11 life path myself, so the lessons around being true to who I am are a constant struggle for me. 2018 happened to be an 11/2 year, meaning the core frequency of the 2 was also at work. The two is the number of relationships, balance, and harmony. Even though it seemed like the focus was on us, part of confronting our authenticity involved healing those parts of ourselves in others. Relationships were emphasized this year- perhaps they under went serious evaluation, rebuilding, or strengthening. When we are able to heal our relationships, we heal those parts within ourselves that have been buried, neglected, wounded, or forgotten. When we are able to confront who we are, we gain confidence and trust- two things the 11 struggles with. Confronting our authenticity creates sacred reciprocity- the ability to have a relationship with the unseen and spiritual. We develop a profound understanding of our place in the world which helps us better serve our purpose. I noticed many people experienced tragedies and setbacks that forced them to deal with issues they were avoiding. When we experience big upsets, it’s always the last attempt from the universe to wake us up. It’s a beautiful act of awakening that is disguised as a horrible catastrophe. It’s amazing that when we experience just some of the above mentioned things, we unlock the power of who we are. It’s a special kind of magic that only appears when it’s time for us to upgrade to a more purposeful version of ourselves. 2019 will be a universal 3 year, a time for us to share our new selves no matter how much opposition we face internally or externally. a mixture of things, especially a musical or literary medley. I’m not a fan of Marvel movies or superheroes, but when Black Panther was released on Netflix I was curious to see what all the fuss was about. I have to admit, I enjoyed it! I thought the storyline was ingenious a meteorite with super high vibe minerals, an advanced country presenting itself as a third world country, and lots of metaphysical rituals. It left me thinking that nothing is ever as it presents itself. If Marvel keeps putting out movies with a new age twist like they did with Dr. Strange and Black Panther, I might actually become a fan of the superhero genre. Jodi Sky Rogers is a life coach and self-care guru who I stumbled upon through Instagram. She empowers women to nurture their inner wild spirit through cultivating simple yet effective self-care techniques. She is a beautiful writer who makes the art of comfort and nourishment poetic and blissful. I would highly recommend checking out her website here. Last month I visited my local New Age shop to purchase some books on Bach Flower Therapy. While perusing the shop, I came across a pile of books stacked on the floor whose top book was glistening under the flourescent lighting and whispering my name. It was Garden Spells. My synchonistic meeting with this book was beautiful. I went into the shop to purchase books on flower therapy (which I did) and left with a novel about floriography (the art of interpreting flowers). The messages in this book were what I needed to absorb at the time, and thus I am grateful for our encounter. 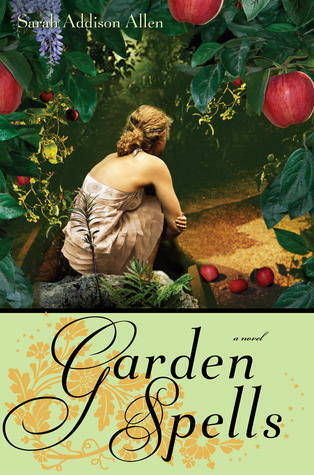 This book follows two sisters and their magical garden in North Carolina. This was the second book to make me cry because I related so deeply to the sisters’ perseverance and struggles. If you think a magical apple tree and unrequited love might be your cup of tea, pick up a copy of Garden Spells...you won’t be disappointed. I have created an additional blog all about Bach Flower Essences and their Astrological & Occult connections. I am currently studying to become a Bach Flower Practitioner and felt that the time has come to express this new side of me in a written format where I can share all of my insights and knowledge about this new path. It is my hope that you will learn something new and interesting about this floral therapy. I have a few articles already posted and will be blogging on there every week, so stay tuned! I will still be active on The Luminessence and have lots of interesting in depth articles coming up shortly. Wow! It’s been a while since I’ve done a monthly favourites, so I thought it would be fun to share what I was up to in the month of July. I will also be discussing some changes that are coming to The Luminessence towards the end of this blog. The season of Leo always brings changes to my identity and branding! I have decided to change some things around on this blog that will better reflect where I currently am on my path and where I am headed. I will be removing the Astro-Witchery section as I don’t actually perform rituals and don’t want this to become a Wiccan blog. I will be adding a new category called ‘Astrology Articles’ since all Astrology blogs are being categorized into my ‘Cosmic Forecasts’ heading. I will be adding a Freebies category where I will be offering free downloadable items such as e-books, desktop wallpapers, fact sheets, and so much more! I am also starting my training to be a Bach Flower Practitioner so I will be slowly adding relevant content to this blog as well. I might be removing the ‘Nakshatra’ series from my blog as I no longer want to focus on Vedic Astrology…more on this later. I will also be adding some cosmic stories about my personal experiences with different cosmic energies. I am hoping this will be a valuable instructional tool. I have also updated the About section on this blog with more facts about me! Also please be sure to follow me on Instagram @theluminessence. I post a lot of interesting things about Astrology and mysticism on there that I haven’t blogged about. I always feel melancholy when the warm weather arrives. It’s on days when it’s 30 degrees Celsius that are the worst. I feel like I’m suffocating. It’s sort of like a cosmic claustrophobia. The heat from the Sun possesses me. Hot weather drains my inspiration, while cold weather feeds me. I believe there is an Astrological explanation for all of this. We all possess a certain dominant season within us that comes to life at its natural time of the year. Like clocks and calendars we have our own bio rhythm that either makes us dance when the music starts or forces us to sit on the bench. I only have 1 planet in a Summer sign and I have an awful relationship with that planet, it’s actually debilitated. Most of my planets are in Winter signs, and I normally don’t experience anything until the latter half of the year when the chilly weather arrives. You will notice that you either bloom or wither away during your dominant season. Knowing your astro season can help you navigate the year. If you don’t have a dominant season, it just means you have a more balanced life. Down below you will see the zodiac signs & their corresponding seasons. If you are in the Southern Hemisphere, you can always reverse this. It works just as well. Let’s get back down to the “nature” aspect of Astrology. Excuse me while I zone out in this catatonic heat like fellow Winter/Cold dominant lady Elizabeth Taylor. What’s your dominant season? Do you find your life takes off in those months? How do you feel? Comment down below!